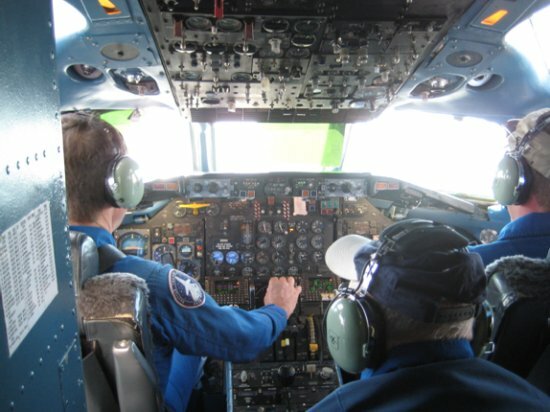 All together we’ve got four NASA pilots flying the SCA 747 this time; Charlie Justiz, Frank Marlow, Jack Nickel and SCA Chief Pilot, Jeff Moultrie. 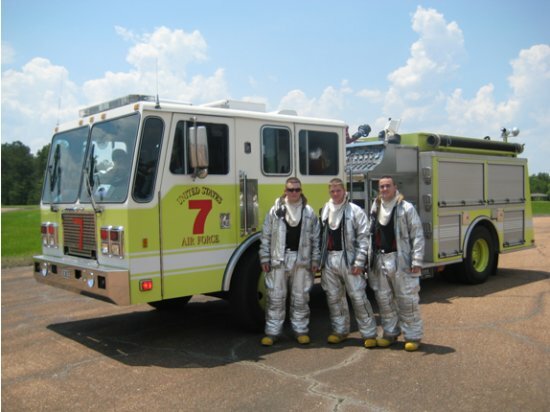 These guys are former military aviators and are based out of Johnson Space Center in Houston, Texas. (We also have one more SCA pilot, Bill Brocket, who’s based out of Dryden. He wasn’t able to make this trip.) 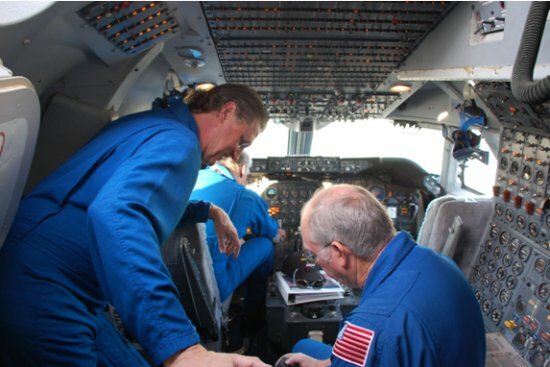 Together, these four have logged a whole lot of hours of flight time in everything from shuttle training planes to T-38 jets to the Super Guppy. They definitely know what they’re doing. I found out that the number of SCA refueling stops, like this one at Lackland, depends on the weight of the orbiter on top and the weather along the way, but the carrier must stop to refuel at least once on its trip to Kennedy. 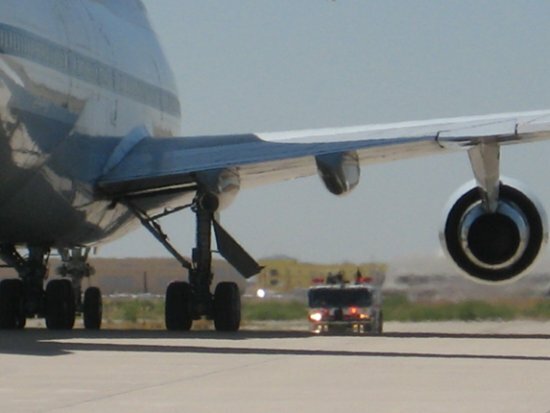 During a normal flight, the 747 can use 20,000 pounds of fuel an hour. 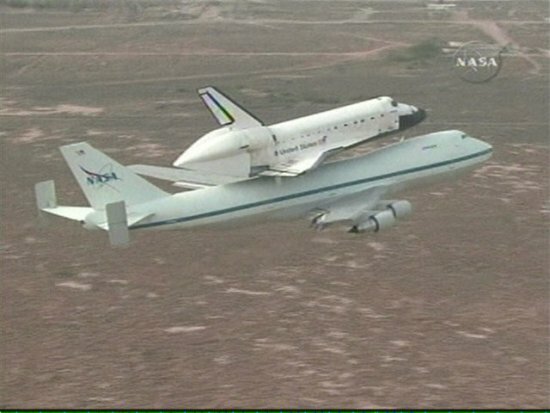 With Atlantis on its back, the SCA uses twice as much! 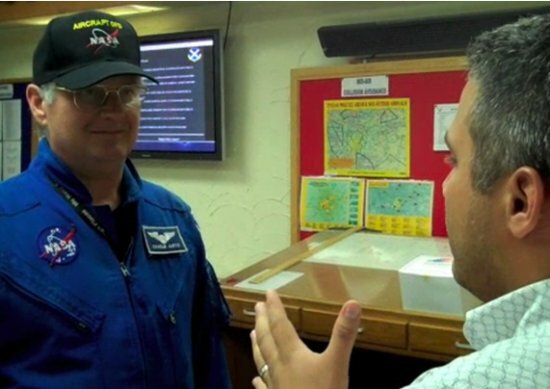 While we had some time here in San Antonio, I had a chat with NASA pilot, Charlie Justiz. I wanted to hear what he had to say about what it takes to fly a 747 with a shuttle strapped to your back. Here’s a piece of my conversation with Charlie. Southerners sure know how to make a shuttle team feel appreciated. 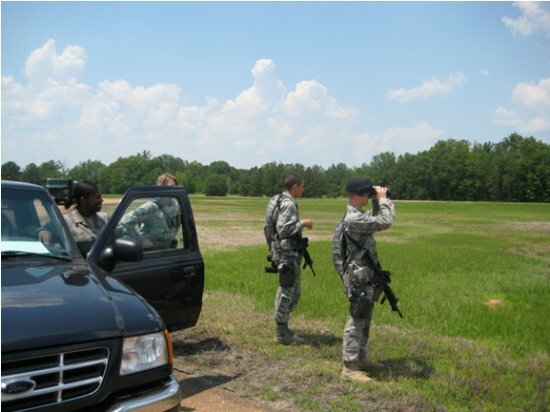 We made our final fuel stop of the trip at Columbus Air Force Base in Columbus, Mississippi. We arrived here to a very warm reception. As we were landing I looked out the window of the C-9 and saw a long line of cars parked along the road with people waiting to see Atlantis come in. They tell me that some of the people were even tailgating! That’s the way to do it right. 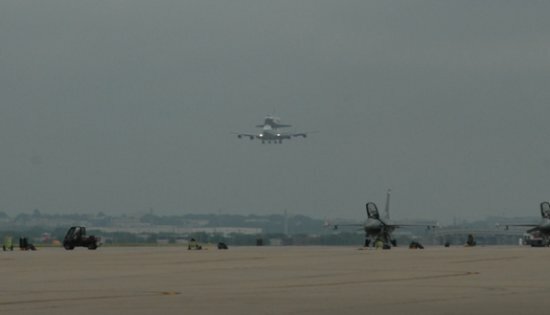 Here is some video of the SCA and Atlantis landing at Columbus. And of course, fuel trucks. As soon as the SCA was stopped and secured I decided I needed to get as close up as I could. I saw reporters and news cameras standing back in the media section and I kind of laughed because I knew you guys we’re going to get a better view than they were. I gave a quick walk around the SCA and then I even got to sneak up into the cabin to have a look at the inside. Here’s the video of the SCA walkaround. We should be leaving Columbus at about 3:40 pm CDT and arrive at the Shuttle Landing Facility at KSC at around 6:30 pm EDT. They are telling me that if weather permits, the SCA and Atlantis will do a fly-by of the beach. On to the Sunshine State! Well, we made it. Atlantis landed here at the Shuttle Landing Facility at KSC. The official landing time was 6:53 pm EDT. Check out this video of the landing. The trip was a blast, but it is great to see Atlantis safe and sound at home here in Florida. Even though the trip is over, the blog’s not done yet. I got some great video and pictures from our stop in Mississippi. I actually took a quick tour of the SCA and snuck a picture of me in the pilot’s seat. I’ll have those up as soon as possible. Check back later for the last few updates. 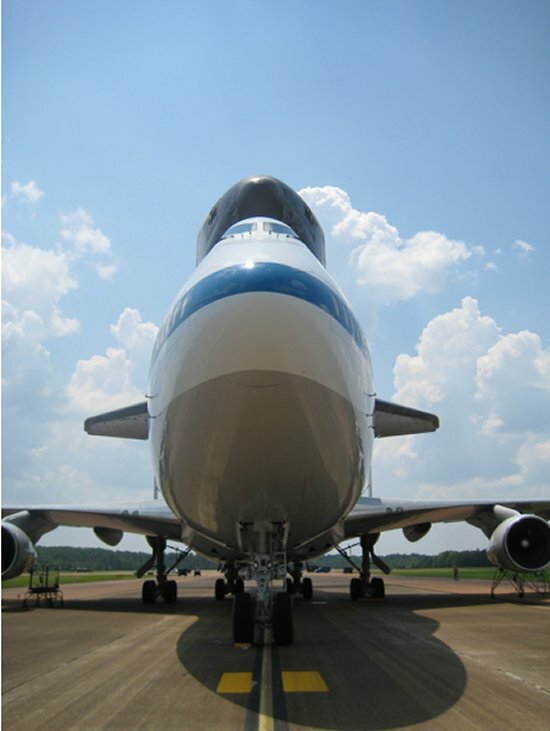 Atlantis Leaving Mississippi — May Visit the Beach? The Atlantis Ferry Flight will depart Columbus Air Force Base in Mississippi at approximately 3:40 pm CDT and arrive at the Shuttle Landing Facility at NASA’s Kennedy Space Center at approximately 6:30 pm EDT. Pilots will do a fly-by of the beach if weather permits. Earlier this afternoon, a huge crowd of well-wishers gathered at Columbus to welcome Atlantis when it landed en route from San Antonio. The stop in Mississippi allowed refueling and a weather briefing before resuming the trip to Florida. Stay tuned — recap photos and videos are on the way after Atlantis lands at Kennedy Space Center! 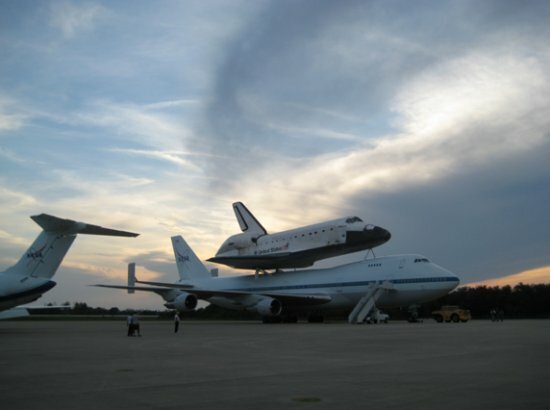 Author dnkaniganPosted on June 2, 2009 Tags Atlantis, Columbus Air Force Base, Daniel Kanigan, ferry flight, flight route, Kennedy Space Center, piggyback, space shuttle, STS-125, weather13 Comments on Atlantis Leaving Mississippi — May Visit the Beach? 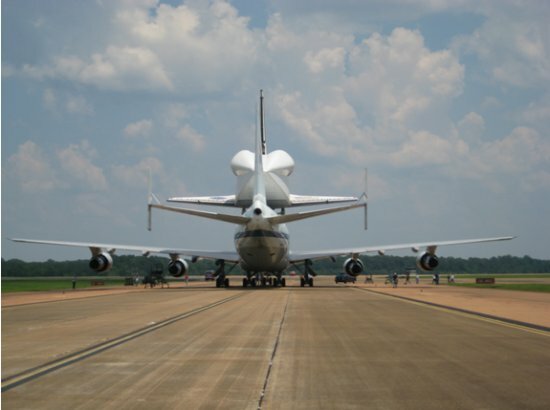 Space shuttle Atlantis is on its way to its second stop today in its cross-country ferry flight, Columbus Air Force Base in Mississippi. 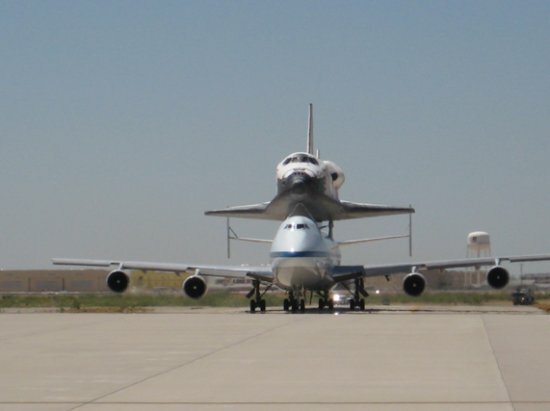 Atlantis and its modified Boeing 747 Shuttle Carrier Aircraft departed Lackland Air Force Base in San Antonio, Texas at about 12:37 p.m. EDT (11:37 a.m. CDT). The flight is expected to take about two hours. Once Atlantis gets to Columbus Air Force Base managers will assess the weather and determine what the best route is to arrive at NASA’s Kennedy Space Center in Florida this evening. We just landed here at Lackland Air Force Base’s Kelly Field. I scrambled off the C-9 and made it out on the runway in time see Atlantis/SCA’s second Texas landing. We’ll have video soon! The 37th Training Wing here at Lackland AFB, San Antonio, Texas, is the largest training wing in the Air Force. Kelly Field is the longest continually used runway in the Air Force (since 1917) and population wise is the largest Air Force base in the United States. 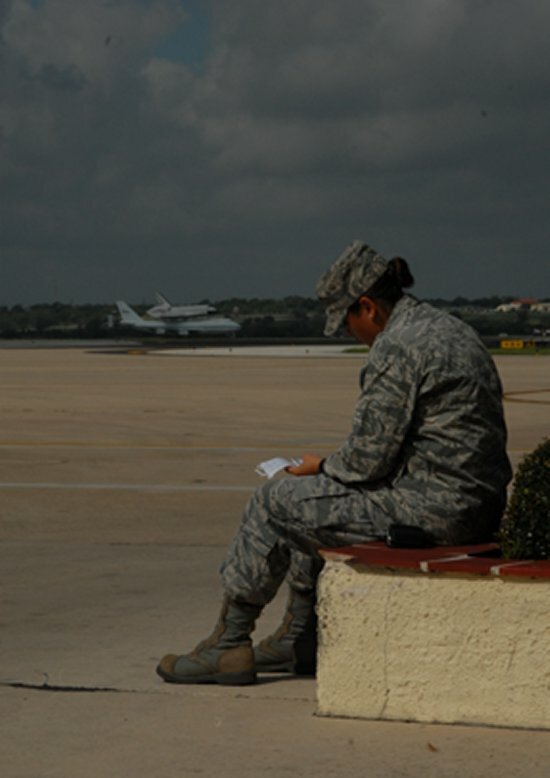 Ben, our photographer caught this cool shot of Lackland AFB 2nd Lieutenant, Natassia Cherne taking a moment after the landing. We’ll refuel here, take a minute for lunch and to get one last check of the weather forecasts and then be on our way to Mississippi. We’re sitting on the C-9 here at Biggs and the engines are humming. We’re a few minutes away from take off, heading to Kelly Field at Lackland, near San Antonio, Texas. We should get in there at about 9:00 local time. Yep, Texas is really so big that we need two stops to get across it. 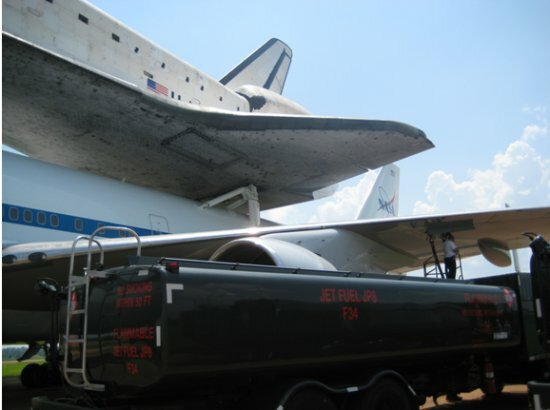 We’ll get fuel at Kelly and then continue on to Columbus Air Force Base in Columbus, Mississippi. It looks like we’ll get there at about 1:00 CST. Hope that helps. I’ll update it if we get new info. Here’s a shot of Atlantis and the SCA getting ready to roll out behind us. I “borrowed” a bunch of pictures from our NASA photographer, Ben Smegelsky so throughout the day I’m going to go back and snap them to previous posts. Some of them are pretty nice so you may want to go back and check them out. 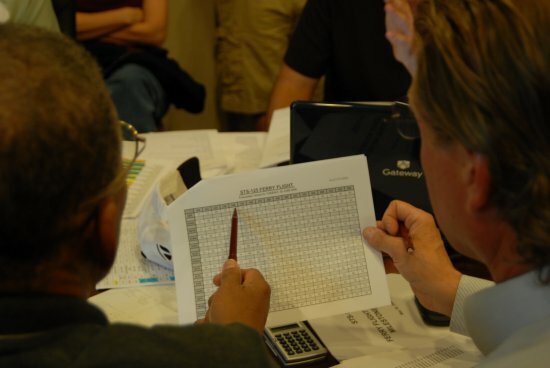 Right now the team is hunkered down in a conference room here at the hotel pouring over data sheets and weather charts. Underneath the chatter of the discussions you can hear them clicking and clacking away at laptop keyboards and calculators. So far everything is looking good and we should have a flight route for tomorrow soon. I’ve been reading the comments and one of the most popular questions is, “when is Atlantis flying over my town?” It’s not as easy as you might think to answer that question. In order to get the shuttle home to Kennedy Space Center, we have quite a few rules and restrictions we have to follow. First of all, we have to be very careful about the kind of weather we fly into and out of and through. And as you all know, forecasts change all the time. Flying from Southern California to Central Florida we are really dealing with weather planning across the entire southern half of the US — and meeting all our other strict constraints on temperature, clouds and precipitation. Put all of that together and you can see why it’s tough to say where we’re going to be and when we’re going to get there. Today’s first leg flight is a perfect example of how crazy the scheduling challenges can be. 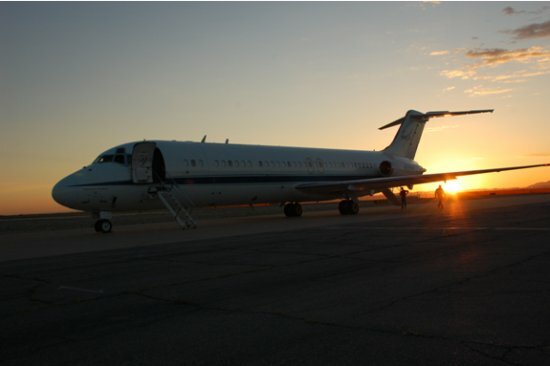 We had originally planned for just a fuel layover in El Paso, then added an option to go north to Amarillo instead of El Paso and finally needed to pick just stopping at El Paso for the day. This is a good question that doesn’t have a quick easy answer. First of all, we start with a list of airfields (about 20), primarily military bases that are on an approved list of airfields to be used during a ferry mission. Each of these bases has agreed to accommodate an SCA/Orbiter landing and each has personnel trained to do so. There is a very specific set of requirements that must be satisfied by each base. 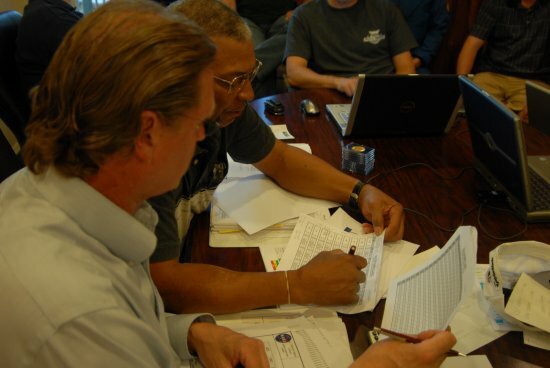 These requirements include providing security for the Orbiter, providing a safe place to park an Orbiter that still has highly toxic commodities on board, has ground support equipment that can reach the Orbiter on top of the SCA if it is required, and not least of all, is willing to accept the disruption to normal operations that is caused when we arrive. In addition, if the ferry stop is overnight, the base also arranges for transportation and lodging of the ferry team. Second, the Orbiter has a very restrictive set of atmospheric/weather requirements. We must, at all cost, avoid rain in flight. Flying through rain will damage the Orbiter’s thermal protection system and result in a costly and long delay before the Orbiter’s next flight. We also try very hard to avoid exposing the Orbiter to severe weather on the ground, which could also cause damage. The Orbiter cannot be exposed to temperatures less than 15 F either in flight or on the ground and the Orbiter cannot fly at an altitude where the pressure is less than 8 psia. These requirements typically limit our altitude to an 11,000 to 16,000 ft range. So, the SCA/Orbiter route is largely driven by the bases that are available and the weather en route. In addition, the SCA has a very limited range when ferrying the Orbiter. That range depends primarily on the weight of the Orbiter and the air temperature. Winds are also a factor. The heavier the Orbiter is, the less fuel we can load into the SCA, pure and simple. 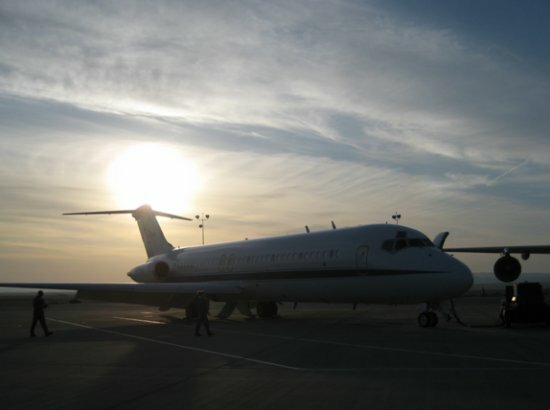 Without going into a lot of technical details, hotter air is less dense air and that too significantly impacts the performance of the aircraft. Finally, hardware issues can also impact our route selection by causing delays. During delays, the weather changes and often times so does the route. So, there are many factors that drive the route we take with weather being the big one. And as everyone can understand, predicting the weather is not an exact science. That’s the biggest reason that it’s often the morning of the flight before we can say, with certainty, where we’re going. I told you he knew his stuff. Okay, maybe not geographically the heart of Texas, but close enough. We landed at Biggs Army Airfield near El Paso, Texas. 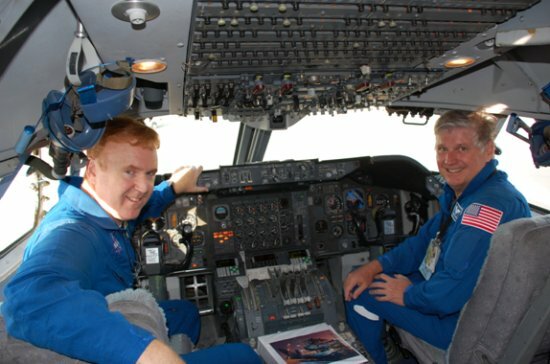 The flight seemed really quick and I’ll tell you something, flying with NASA pilots beats flying commercial any day. These guys don’t mess around! If we’re banking left, we are BANKING LEFT! NASA pilots are also patient enough to let me take their picture while flying. 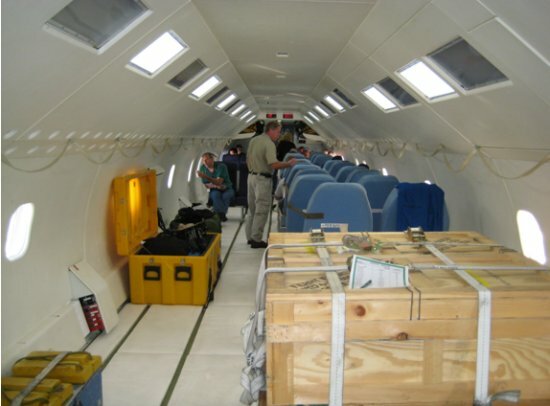 The pathfinder plane that we were all flying in is a NASA C-9 airplane. 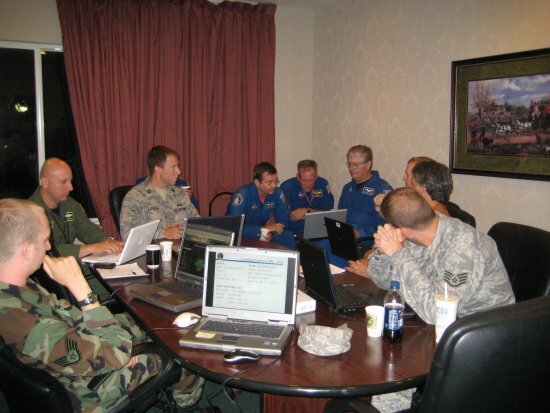 We had the weather officers and quite a few from the shuttle team on board with us and we were flying about 100 miles in front of Atlantis and the SCA. Here’s how the C-9 looks from the outside. Here’s what it looks like on the inside. Not necessarily plush, but they did pass out Fritos and soda. Like I said, we’re in Texas at our first stop. We landed here at Biggs at 11:22 am MDT. The shuttle team now has meetings all afternoon where they’ll keep a close eye on the weather forecasts and plot out the rest of our route. Here are some pics and a quick video of Atlantis and the SCA landing. We’re going to stay here overnight and if all goes as planned and the weather cooperates we’ll be on our way in the morning. 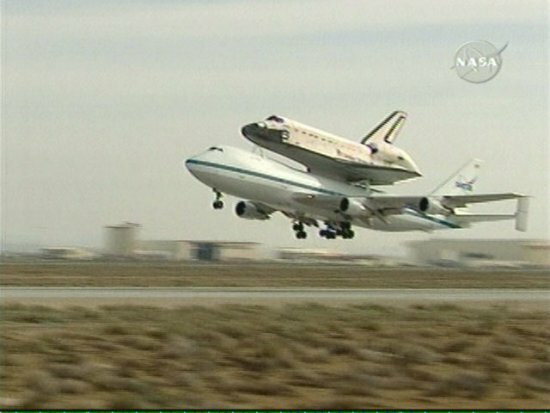 Space shuttle Atlantis’ ferry flight is under way! The modified Boeing 747 Shuttle Carrier Aircraft carrying Atlantis took off from Edwards Air Force Base in California at 11:06 a.m. EDT. 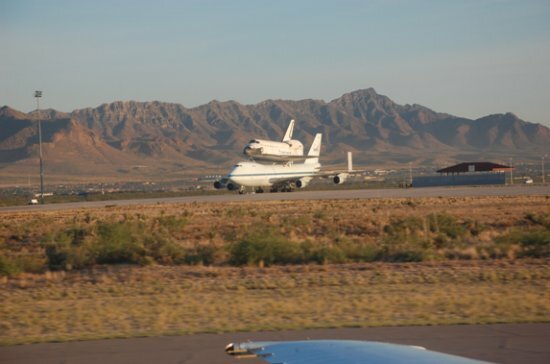 The Shuttle Carrier Aircraft is heading to Biggs Army Air Field in El Paso, Texas, and is expected to arrive about 1:10 p.m. EDT. The shuttle and the ferry flight team will stay at Biggs overnight and then continue on tomorrow morning to NASA’s Kennedy Space Center.